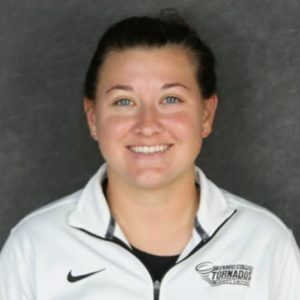 Coach Kristin Rosato has been a member of the Tornado family since 2015. After assisting with the women's soccer team, Coach Rosato was promoted to the position of head coach for the women's lacrosse team. Since then, Coach Rosato guided Brevard to their first South Atlantic Conference postseason appearance with a 9-7 overall record and a 4-4 league mark. That same year the program set records for wins in a season with nine, goals (162), assists (74), caused turnovers (140) and ground balls (362). Toward the end of the 2017-2018 season, Coach Rosato helped lead the women's lacrosse team to victory in earning the Tornado Cup in light of the team's dedication to community service. In her free time, you may find Coach Rosato walking her dog, Lola, around campus or dominating the local trivia scene!